Whether your kids are returning to junior college or a university, they probably have a digital device. Your kids likely have a laptop they’ll use for YouTube and the occasional homework assignment. They could have a smartphone or tablet with lots of precious photos and music on it. In addition, busy students have two curious traits: they rarely take the time to backup and they tend to frequently misplace or drop their devices. Before school starts and disaster strikes, students should consider a cloud storage service to keep their school files safe and accessible. Why do student devices need to be backed up? Because accidents happen and hardware isn’t meant to last forever. Eventually most phones and cameras will give out, get lost or find themselves taking a little swim. Never fear! We have a quick step-by-step guide on how to back up your devices easily. We can also recommend without hesitation, the latest version 2.0 of Bitcasa, which we find provides the most secure and comprehensive storage solution available today. This means everything from an affordable price to large capacity, high security, and automatic backup of every device you own. Choosing a reliable online storage provider that’s encrypted, like Bitcasa, means students can have confidence in storing and accessing their stuff from anywhere, even public cafes. Bitcasa is also unique in that it appears as a virtual hard drive, so you already know how to use it. Bitcasa calls it the Infinite Drive because it’s a hard drive that never runs out of space and never crashes. Even more, it works on all your devices from laptops and desktops to phones and tablets. It will automatically backup all your devices and let you retrieve any past version of a file, even if you delete it. 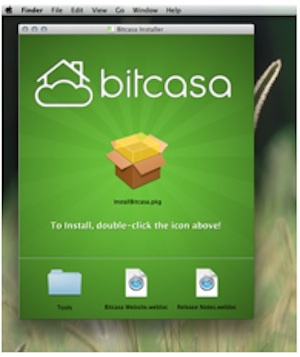 Download the Bitcasa app for your Mac or PC. If you have an iOS or Android device, you can just go the the App Store and search for “Bitcasa”. You should download the app for each device you own so can share your files, or you can just point your web browser to https://my.bitcasa.com. 2. Create a Bitcasa Account. 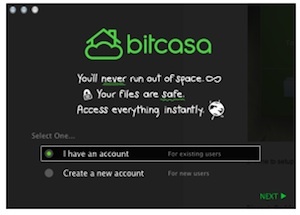 Once Bitcasa is installed, you can create a new account or use an existing one if you’ve used the service before. 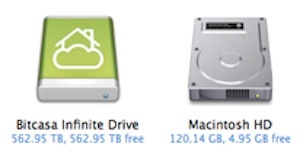 Once you’re logged in, you will see a brand new hard drive on your desktop called “Bitcasa Infinite Drive”. It’s infinite because it will never run out of space and never crash on you. Double click on it and check it out. It works just like a hard drive. Notice how much free space it has — it will never fill up! 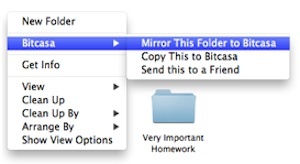 To backup any folder, just right-click on the folder and select Mirror This Folder to Bitcasa. That’s it! From that point on, any changes you make to that folder will be backed up and encrypted automatically for you — you’ll never have to back up again. Now you’re cool for school. You’ll be saving, sending, streaming and sharing all your school files and media files with ease and privacy. You’re all set to go back to school, and so are your gadgets! 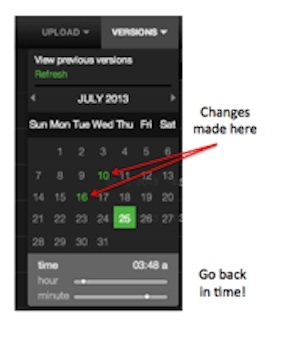 If you accidentally delete a file, overwrite a file, or modify a file, you can go back in time and retrieve any past version. Try it out by going to https://my.bitcasa.com. Free Up Space – When you can’t install any more apps or games, just move your big files to Bitcasa and free up space on your laptop or phone. Go ahead and move your big iTunes or iPhotos folders straight to Bitcasa. Back Up Your Phone – In the Bitcasa iOS or Android app, you can turn on Camera Backup to automatically make copies of your photos and videos to Bitcasa. Then you can delete your big videos and take more pictures. Or if you lose your phone, no worries! Share Files Fast – Bitcasa lets you share a 5GB file in 5 seconds, or a folder of all your graduation photos with one click. Bitcasa let’s you create a web link for any file or folder and share it over email, twitter, or facebook. Size doesn’t matter and non-Bitcasa users can view your stuff too. Stream Movies in 1080p full HD – Want to create your own Netflix or Spotify? From your laptop or your Android device, you can stream your music or videos in full HD. If you have an Apple TV or Chromecast device, you can play it on the big screen! 17 Responses to What’s the Best Cloud Storage for a College-bound Student? Never heard of them, I’ll have to check them out thanks! I have never heard of it either but I so need to use it! I am terrible at backing things up and need to get into the habit of doing do. My external hard drives are not enough storage for the photos I take so this just might be the solution for me. I had never heard of them. Thanks so much for sharing. Cloud backups are a must. You can never have too many backup methods! This is the first I’ve heard of them – 10GB free is an awesome way to start off too! I like that you only have to set up the individual folders to mirror once. How nice that you only set it up once! Sounds like a great option for backing up! I’ll have to tell my brother in law about this. I agree, it is useful for anyone. And you’re right about the homework (high school and college students may not be too thrilled about that). lol. I love being able to use a cloud backup for storage! I’ve never heard of this resource. Thanks for sharing. I’ve been using Bitcasa for a few months now and can highly recommend it. I’ve got a few TB uploaded, for the price you really can’t go wrong, uploads are really fast (depends on your connection, we’ve got fibre here). Yup, Ive been using Bitcasa since the beta stage (July 2012) and I must say it´s awesome. And they keep improving it often.